Today we have another ‘at risk’ herb. United Plant Savers highlights some of the issues with growing this herb and why it is so difficult to cultivate. Although eyebright self-propagates by seeds and grows in a variety of climatic conditions, it is by nature a “wild plant,” difficult to cultivate in the garden. In fact, I know of no one who has succeeded at doing so. The reason is thought to be that eyebright is a semiparasitic plant, needing to grow among certain grasses from which it gets its nourishment. 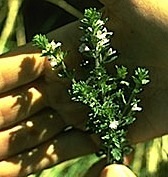 Viewed from above the ground, eyebright does not have the appearance of a parasitic plant in that it has normal flowers and bright green leaves; parasitic plants are usually devoid of the green color of chlorophyll. Below ground, however, the suckers from eyebright’s roots entangle themselves among the roots of the surrounding grasses, forming tiny nodules which come into contact with and absorb nutrients from the grass rootlets. The grasses are not seriously affected, because the absorptive cells from eyebright’s nodules do not penetrate deeply into the grass rootlets, and because eyebright—an annual that dies off each winter—does not cause a permanent nutrient drain on the grasses. As its name implies this herb is used for issues of the eye including conjunctivitis and eye strain. Personally I have never used this herb nor have I attempted to grow it. My view is that there are many alternatives to this herb so why not use those? For instance: Sage, horseradish, green tea, red clover, and yarrow. I've not heard of Eyebright before. It was good to learn about it. I agree with you. It's not some I think I would use for the very same reason. It's good that there are man alternatives that work in the same capacity as this herb does. Is it hard to find in herbal stores as well? Hi Cheryl: Yes, I'm one of those people who would prefer to read a brief post about something that might include a link to a video or more indepth info. So thanks for this. Interesting about Eyebright. Never heard of it, but with a growing segment of the population aging and becoming susceptible to glaucoma and macular degeneration, this is a hot topic! Thx for sharing. Have to admit I had never heard of eyebright before. Neither have I seen supplements of it in health food stores anywhere in the world. Or maybe my memory fails me. Personally believe the reason readers objected to your videos is because they were far too long. A video should not be longer than five minutes. Less than two is even better.